GEORGE W. KING (B): born at Hepthorne Lane, near Chesterfield, of a fine Methodist stock. He commenced to preach at the age of fifteen and entered the Primitive Methodist Ministry in 1914. His circuits were mainly in industrial areas in the North of England. In each he left a deep and abiding impression. He was a man of beautiful spirit, tender, and yet ever a fighter against wrong, with well-stored mind which delighted in the best that literature could give. He had a passion for social righteousness, but it was grounded in a passion for God. He was a modern Sir Galahad in his quest for a Christian social order, a faithful minister of the gospel, and withal a perfect Christian gentleman. He hated war with an intense hatred and never lost an opportunity of advocating peace. Men seldom seen inside a church came under his magnetic influence and grew to love him. In the prime of life he was stricken with disease, but even in the most trying circumstances his spirit radiated cheerfulness, hope, and courage. 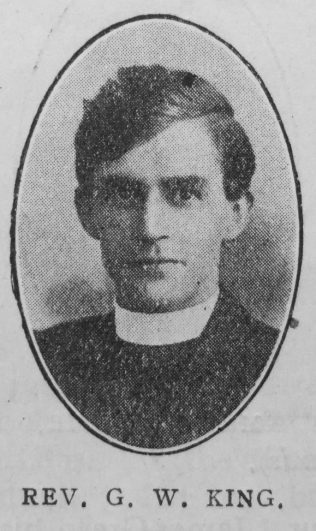 In the twenty-fourth year of his ministry, he passed into higher service on December 14, 1937. George was born in 1888 at Hepthorne Lane, near Chesterfield, Derbyshire, to parents Joseph and Maria. Joseph was a family butcher (1911). George assisted in the family business before entering the ministry. George died on 14 December 1937 at Brampton, Cumberland.